This morning, I ran out of my usual breakfast staple of an Ezekiel english muffin with raw almond or peanut butter. I had to go with oatmeal. Oatmeal is so boring... not like when we were kids and strawberries and cream was the jam. But I digress... I decided to jazz it up with some key healthy ingredients. These additions not only made it even more healthy than it already is, but, also added some crunch and FLAVA. Here's what I added and what makes these ingredients SO HEALTHY. - ground flax meal: You've probably heard of flax seeds/meal. What you may not know is that you don't really see the health benefits of flax unless it is ground up. This little tbs added a big dose of omega-3's, antioxidants, & fiber. - sunflower seeds: These little seeds provide significant amounts of vitamin E, magnesium and selenium. Vitamin E is an antioxidant, has anti-inflammatory properties, & has been known to lower cholesterol. - blueberries: I love blueberries. Frozen berries are pretty much just as healthy as fresh. They are frozen immediately rather than sitting on a truck for a week. Anyway, as you probably already know, blueberries are extremely high in antioxidants. - wheat germ: Just a couple tbs has a decent amount of protein, iron, folic acid, potassium, and vitamin E. Not sure why we don't see more about wheat germ. My 90+ year old great grandfather ate it throughout most of his life. He's 90-something! - cinnamon: This flavor enhancer has one of the highest antioxidant levels out of any food! It also helps control blood sugar. Bring it on. Learn more about antioxidants here and here. 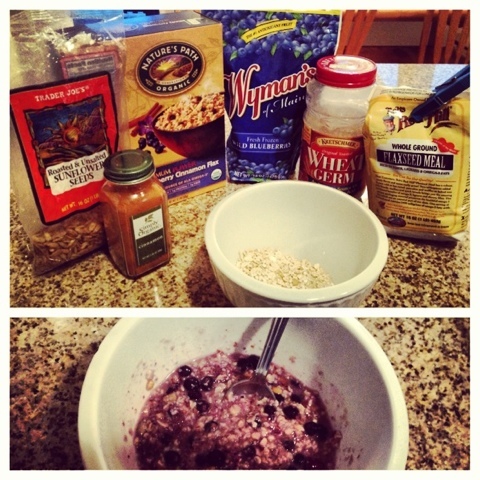 Sorry that oatmeal looks so ugly.